Mobile Apps and Mobile-Friendly Websites for Business: The Next Big Thing in Internet Marketing? Shortly after Internet accessibility via mobile phones started to take off, marketers started to encourage businesses to build mobile versions of their websites. But there is always a gap between innovations and those who follow up in order to take advantage of the latest technologies. But, now that there is a meaningful volume of web visitors checking out every website (yes, even yours!) 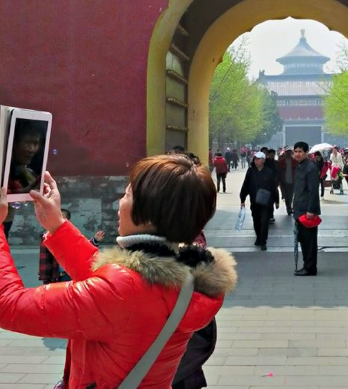 via mobile devices, spanning this gap is becoming more of a requirement. And yet, there are still a very significant number of businesses who don’t have mobile-friendly websites. The really bad news, particularly for those who are falling behind, is that the gap is widening between those who are meeting the demand for mobile-friendly web communications and those who are not. The good news is that there are a new generation of business communication tools arising in the form of apps and new kinds of websites that make meeting this need increasingly accessible. Illuminating these trends with specific examples is the purpose of this blog post. These changes are unquestionably dramatic. While the Web was born on desktop computers, it is obviously no longer simply a desktop medium. By May 2012, fully one tenth of the world’s web traffic was arriving on your digital doorstep via mobile phones and tablets. But that’s just the tip of the iceberg. It’s the “developing” world that is truly leading the charge. In those countries where cell phones have long outnumbered landlines, more than one-half of web use is now coming via mobile devices. This demand for mobile delivery is now forcing the issue and providing further fuel for the shift in how websites are designed. In this environment, for a company to ignore the need for the mobile-friendly delivery of its Web content not only limits that company’s engagement opportunities because they are essentially “dissing” a significant segment of their audience. In the US alone, mobile is now estimated to be about 15% of web traffic. Bottom line, this form of resistance to change (or upgrades) will also exclude that company from a significant component of how the next billion people will get online. Web development for the mobile age itself is advancing quickly. One of the latest innovations is called responsive website designs. Because responsive designs automatically adjust their layout to suit the device being used, they offer a relatively simple solution that can eliminate the complexity of having to create a separate mobile-friendly version of your website. But this means that those—like my company recently—must invest in a redesign in order to keep pace with the mobile revolution. But that’s not all. The pace of change does not slow down. It accelerates. Now, at least for marketers who are committed to the leading edge of engagement with social media savvy users who love their mobile devices, a responsive design may not be enough. Mobile apps are yet another important innovation because they combine the emergence of ever-expanding Web access via mobile devices with the ability to communicate directly, in a native form (i.e. within the mobile medium) via customized business-specific functionalities from Facebook feeds, to special offers, to location-based components. The good news is that some newly developed Web-based SaaS (software as service) resources are make building basic apps far more accessible and affordable than previously imagined. The result is a new trend in mobile marketing: the development of business apps that can be used by companies of virtually any size. Of course, many large, enterprise-level businesses have already jumped on the app bandwagon, including banks, Starbucks, Google, and even Walmart’s new checkout app. Now, there are mobile apps for the rest of us. A business mobile app means that your website can be programmed to offer mobile users an interface for your website and social media content that is all the more friendly, not only with a vertical layout that fits a smartphone screen, but with an interface that features icons (rather than web-style text links) that are also a natural for the touch of a screen. Thus, an app offers more than a responsive website design. An app gives your business a mobile presence that can put local or social media interactivity in a more prominent position. In particular, an app allows your loyal customers and followers to retrieve content, like audio podcasts or video commentaries for example, that are more conveniently accessed while on the move. Likewise, Facebook posts and tweets, which are commonly accessed via mobile, can become part of your business app’s featured content. One logical strategy is use the app to make your social media marketing and content marketing outreach more accessible. For example, when individuals are standing in line at the bank or at the grocery store, with an app at their fingertips, they will much more easily be able browse through your Facebook posts. In fact, they are certainly more likely to visit your Facebook Page while on your app rather than from Facebook’s own app where they are far more than likely to be distracted by their family’s photos, etc. Likewise, if you host a contest, offer a coupon or some other form of promotion, those who get involved with your app can much more quickly check contest updates from an app and receive automated notifications (with permission of course). The app makes waiting for your responsive website to load, asking the user to find the contest page, then wait for that page to load, etc. seem prosaic. An app simply makes any interaction with your web content immediately available with a simple touch of an icon, rather than forcing a web page and more complex navigation through the smaller screen. 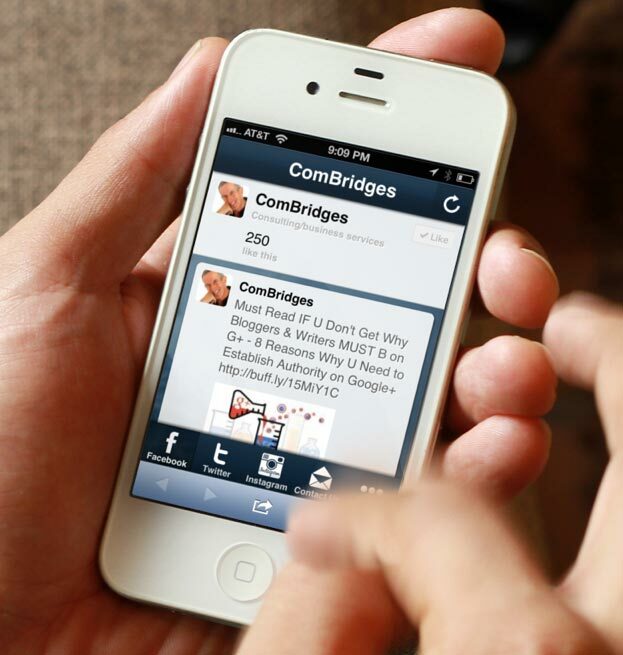 By way of example, as a boutique web design and marketing agency, our company, ComBridges used to have a mobile-friendly version of our website that was visible via smartphones. This was developed using a WordPress plug-in called WPTouch Pro. Recently, we have redesigned and relaunched our own site with a responsive WordPress theme. What opens up the opportunity for a small business like ours (and so many others) to have its own app is online software services like Conduit.com’s Mobile. While these apps do require a small, additional monthly hosting fee, they are easy for developers like us to implement. So much so that some do-it-yourselfer small businesses could even build apps on their own. It’s a work in progress, but if you have a smartphone, you can preview our first generation mobile app via any mobile device at combridges.conduitapps.com. You will notice that what you see on our app looks very different than what you see on our website. It’s designed for mobile interaction. In fact, thanks to Conduit, much of the content is automatically derived from our Facebook Page, Twitter feed and more. As you can see, many of our social media pages are featured along with easy options for contacting us, including click to call functionality. According to Morgan Stanley, 91% of individuals who own smart phones keep their phone within reach 24/7. And 5.1 billion of the 7 billion people on earth own a mobile phone. With these numbers in mind, why wouldn’t every business want to make it easier for their customers, blog readers, Twitter or Facebook followers to engage with them via a mobile app? Another benefit is that if you develop your business app now, before the gap widens further, you may well be seen as an innovator. At the very least, you will prove yourself smart enough to get an early jump on the next wave of mobile marketing strategies, rather than letting the gap widen between you and your competitors, as well as between you and your customers. 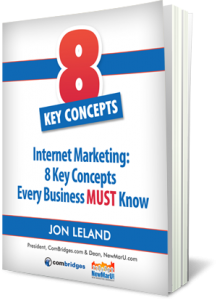 Jon Leland is author of “Internet Marketing: 8 Key Concepts that Every Business MUST Know” and is the president of the boutique web design, video and Internet marketing agency, ComBridges.com. He was assisted in this article by Tara Hornor who also writes for PrintPlace.com, an online printing company. 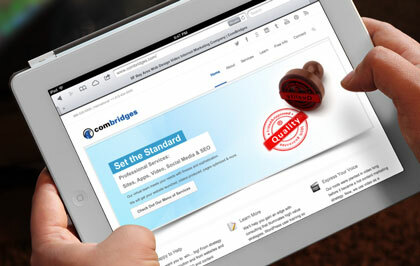 http://www.combridges.com/wp-content/uploads/2017/06/ComBridges-Logo-300x60-300x60.jpg 0 0 JonLeland http://www.combridges.com/wp-content/uploads/2017/06/ComBridges-Logo-300x60-300x60.jpg JonLeland2013-04-25 21:31:132013-04-25 21:31:13Mobile Apps and Mobile-Friendly Websites for Business: The Next Big Thing in Internet Marketing?